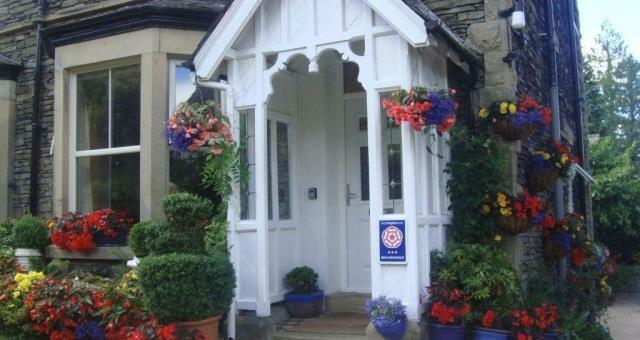 May Cottage sometimes limits bookings to 3 or more days. Children are accepted from 11 years. Super location, quiet, yet close to Lake Windermere, village, restaurants and shops. Hearty breakfasts; comfortable, light rooms with high spec en-suites. High standards of cleanliness. Free use of gym and spa facilities, parking and Wi-Fi. Help and ideas for walks, drives and activities. 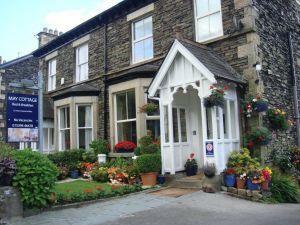 Family-run B&B, relaxing atmosphere with regular guests returning. Leave the M6 jct 36 to The Lakes. Follow A590/A591 to Windermere. Take the left turn into the village opposite the Windermere Hotel. Follow the one-way system into the village. Follow road down towards Bowness and across the mini roundabout in the village then immediately take the first left up into Kendal Road. May Cottage 300yds further on, on right-hand side. Email directions sent by request.